How many prototypes have you seen in multiple colors? 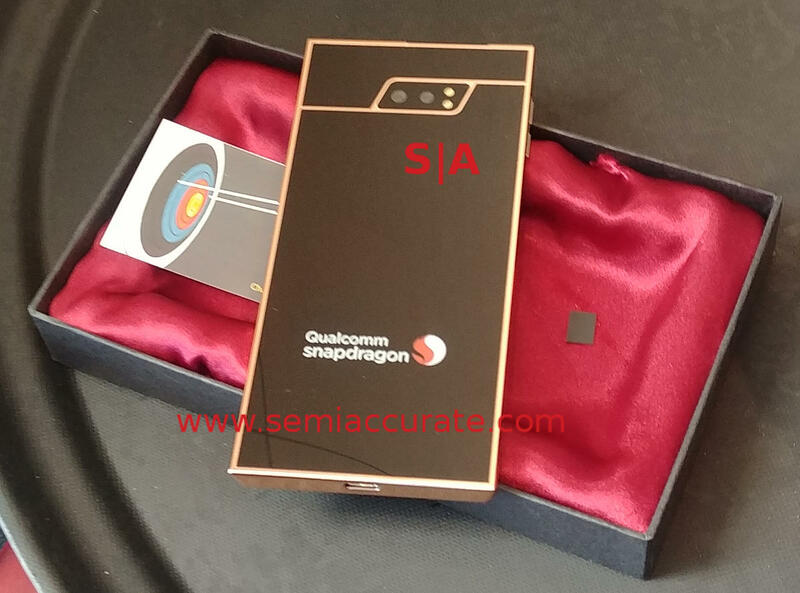 A lot of people have been asking SemiAccurate about the Qualcomm 5G phone we mentioned last week. Since we didn’t write it up before, lets dive in to the device now. The pictures and the device reveal were at Qualcomm’s 4G/5G Summit in Hong Kong last October. 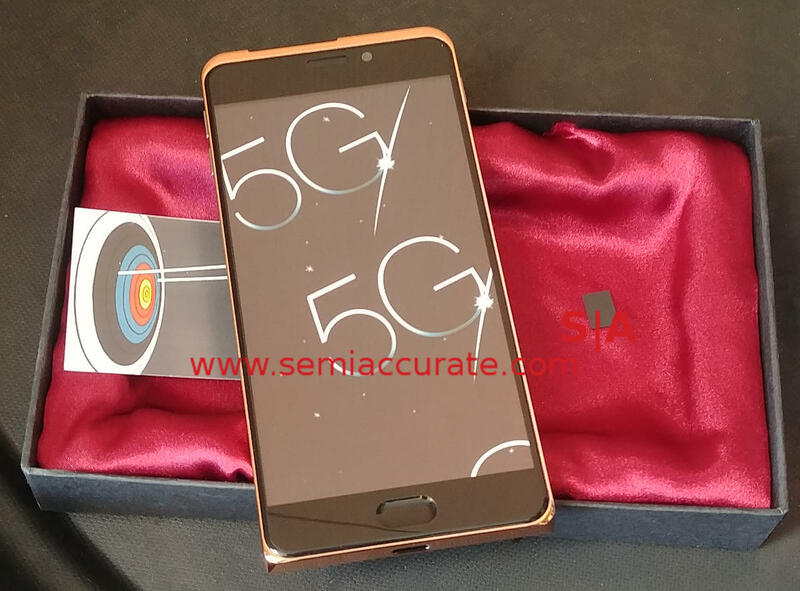 The hardware you see below is the 5G/X50 phone form factor reference design, and as the name suggests, it comes in a phone form factor. As you can see from my business card below it and the USB-C port on the bottom, it is a little, and we mean little, larger than a standard LG G6/Samsung S8 sized phone. It is entirely pocketable if not exactly high fashion. 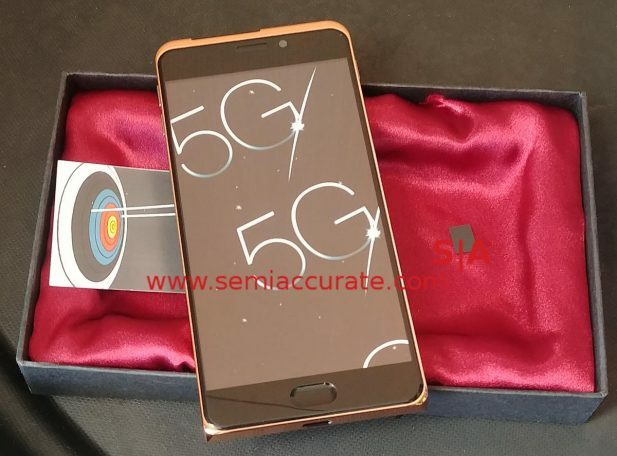 While others can’t show silicon and have to resort to photoshopped pictures of their ‘chips’, not to mention hidden bus mounted, non-standard non-5GNR capable ‘5G’ devices, Qualcomm has had phone form factor 5G devices out for ~6 months. Also note the trim, the one Christiano Amon held up on stage at the 4G/5G Summit was all black, this one is rose gold. Yes Qualcomm 5G phones come in many colors with many being at least two. Scratch what we said above about not exactly being high fashion. Why do we point this out? These aren’t rough first gen silicon proving prototypes, they are well advanced from anything SemiAccurate would consider ‘early’. And that was six months ago. Any guesses what they have now? If you said something more advanced, no points, too easy. One last bit of hanging conspiracy, none of the phones at the show in Hong Kong booted. Some pundits were whispering that the devices were fake so SemiAccurate asked. The answer was quite simple, the hardware at the show last October was completely working and final, the devices at the show didn’t have the current firmware installed so no boot.